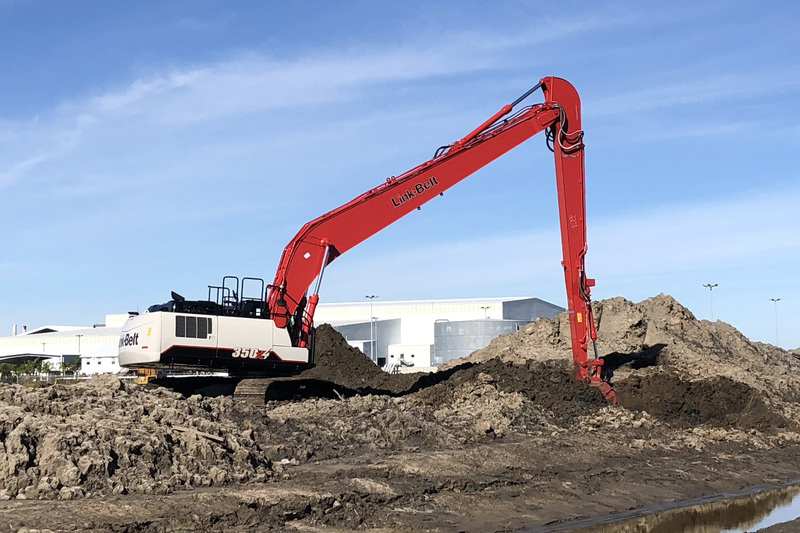 LBX Company announces the Link-Belt 350 X4 Long Front excavator for the US and Canada. The X4 Series features innovative EPA Final Tier 4 engines from Isuzu that strike the ultimate balance between power, productivity and fuel efficiency. You will experience up to 8% improved fuel economy in the base machine, with the added benefit of no costly diesel particulate filters (DPF) to maintain or replace. This machine is the only factory-built long-reach excavator available in this size range. Three engine modes provide reliable power and control for any machine application. Choose Speed Priority (SP mode) to get jobs done quickly, Heavy (H mode) for the best blend of power and fuel savings or Applied Power (A mode), with 13 different RPM settings for precise control of heavy lifting, fine grading or leveling work. The 350 X4 is versatile and tough enough to take on a variety of dredging, cleaning and sloping applications. A large, 7-inch LCD color monitor allows the operator to easily navigate a full menu of user-friendly controls to take full command of the excavator and attachments. The standard rear-view camera is accessible through the monitor, displaying a panoramic view of the worksite from the rear of the machine, with sight guidelines that can be turned on or off by the operator. Rear and side lights can also be added to the camera system. Other notable new cab features include: dual halogen cab lights (with optional LED lighting); a cup holder and storage areas for cell phones and other small items; newly designed joysticks with easy-to-hold grips and radio mute buttons; new MP3 audio input, Bluetooth-enabled for hands-free communication, and a standard control pattern changer so every operator can feel right at home. RemoteCARE® GPS-enabled telematics system allows 24/7 remote monitoring and security. The system tracks and records routine and major service intervals, as well as machine health, providing more flexibility and control when determining when and where to service machines. It also lets you be more proactive if potential failure conditions arise; flashing diagnostic codes on the monitor quickly alert the operator to potential trouble and an e-mail alert is automatically sent. The system also provides machine location in real time for better job supervision and remote security monitoring. A 6-year subscription is included at no extra charge. The 350 X4 LF features a new factory-designed and built long front attachment, matched to factory-tuned hydraulics that offer optimum performance, durability and dynamic stability. Structural improvements on the lowers include a 28% thicker travel motor case; 14% more stroke of recoil spring; and a shape change on the frames for easier cleaning. The Standard Warranty Package includes: 3 yr./3,000 hrs. Full Machine Warranty*; 2 yr./3,000 hrs. Engine Warranty (2 yr./2,000 hrs. electrical parts); 3 yr./5,000 hrs. Powertrain Warranty; 3 yr./10,000 hrs. Machine Structures Warranty; 5 yr./3,000 hrs. EPA Emissions Warranty, along with participation in the X4 Fluid Analysis Program for the life of the warranty.